Say hello to fudge, classy style! Edible Skinny was lucky enough to encounter the world of John Kelly Chocolates during the Holiday season and all we can say is Yummm (with 3Ms)!!! John Kelly’s succulent candy is the perfect ratio of rich chocolate, gooey caramel, and tongue pricking sea salt. Unlike other less superior chocolates (I'm talking to you Trader Joes sea salt caramels...) this chocolate has been balanced with Walter White precision resulting in heavenly velvet perfection! 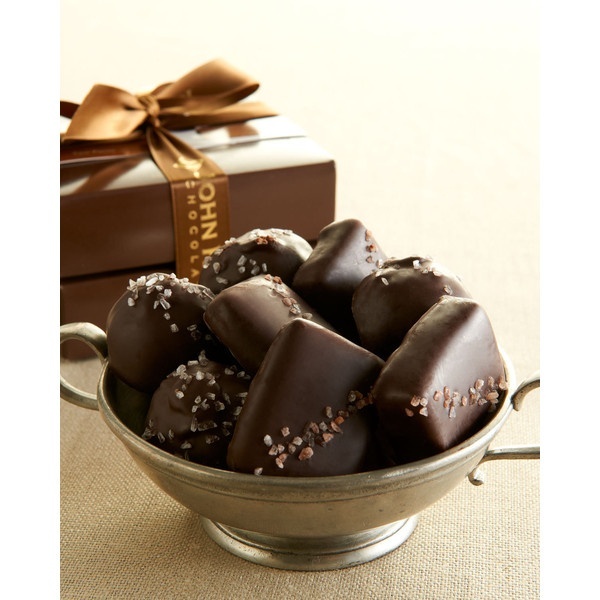 This is chocolate that enrobes your mouth with rich creaminess that whispers luxury into every taste bud of your mouth. Made with high-quality Belgian chocolate and hand crafted in small batches, John Kelly opened a small chocolate factory in Hollywood in 2004. Armed with nothing but determination and a recipe for an amazing, gourmet chocolate fudge, the company have since turned John Kelly Chocolates into an award-winning national brand sold in high-end department stores, specialty shops, hotel gift shops, grocers, and online. John Kelly now makes 17 variations on that original recipe, something they call “truffle fudge”, along with an array of other products, such as walnut caramel clusters, molded chocolates, salted caramels, chocolate-dipped fruit, and more. Edible Skinny was able to experience John Kelly's most popular salted chocolate box Dark Chocolate with French Grey Sea Salt. Each piece was a glistening jewel of taste. Truffles usually have creamy ganache centers, but John Kelly Chocolates makes its product using old-fashioned fudge instead of ganache which only takes the level of creaminess up to 11. And for John Kelly it’s not just about what’s on the inside, the company believes in sophisticated chocolate in sophisticated chocolate boxes. Each bite is hand-lettered in chocolate or sprinkled with salt. And the packaging that houses their candy are paper architecture for the art of elegance. 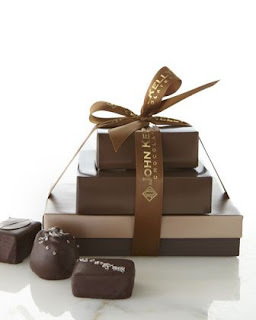 So if you’re looking for the ultimate sophisticated chocolate, John Kelly is your bite of luxury! As the United States inches towards the full legalization of weed, high end marijuana is finding its way into the world of practically everything, including the foodie world. This isn't the bygone days of pot brownies made with Duncan Hines mix; instead we have entered the world where VICE does high end cooking show entitled Munchies, ES gets pitched by press friendly marijuana companies, and the possibility that Bon Appetite or the New York Times covering edibles is an imminent reality. 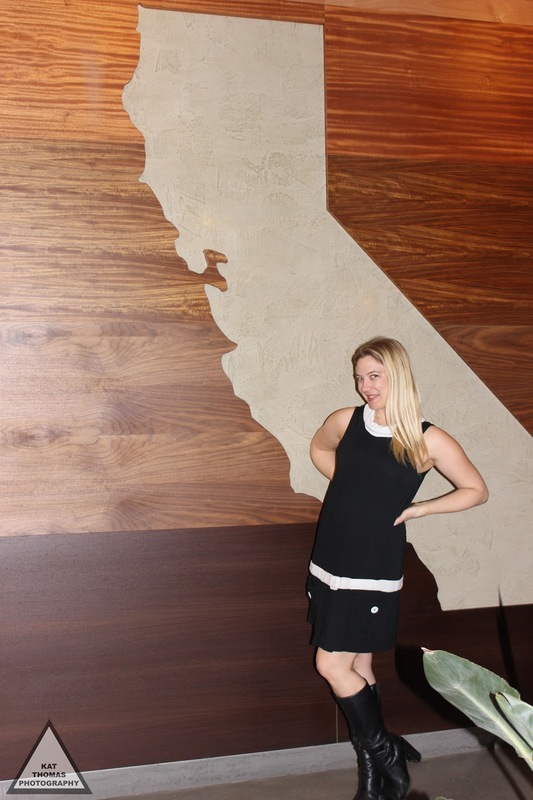 So with a tip to mind expansion being built into the product, Edible Skinny made the conscious choice to enter the world of marijuana edibles coverage with Absolute Xtract’s THC Honey Straws. It's simple, Absolute Xtract’s THC Honey Straws just make life a little sweeter. From a little dab in your morning tea to pouring the whole stick on your Mama's baklava recipe, this honey is pure LOVE in drizzle form! Edible Skinny chose to rock in the New Year with a few drops before four hours of Kirtan (yoga chanting) and it was a fantastico way to greet 2016, experiencing relaxed euphoric mindful connectedness. Absolute Xtracts’ Honey Straws are available in Indica and Sativa varieties, in quantities of 20 mg or 40 mg. This California grown cannabis is paired with natural, local honey to yield that pure, scrumptious flavor. Absolute Xtracts' cannabis oil is sourced in a PFC-certified lab and created with a supercritical C02 method.Absolute Xtracts strains are lab tested for mold, bacteria, and pesticide residues. The strains contain no additives. 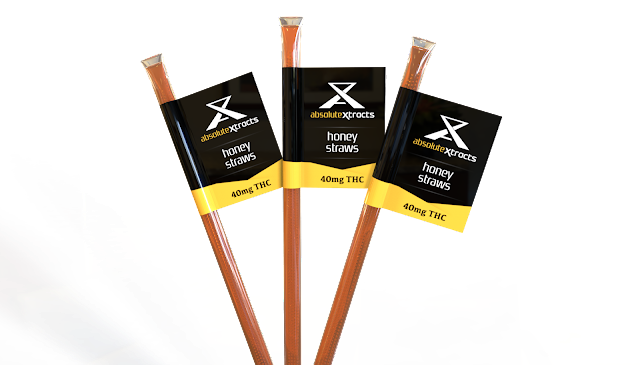 So if you're looking to tap into the world of pure LOVE in a honey stick form we cannot recommend enough Absolute Xtract’s THC Honey Straws. 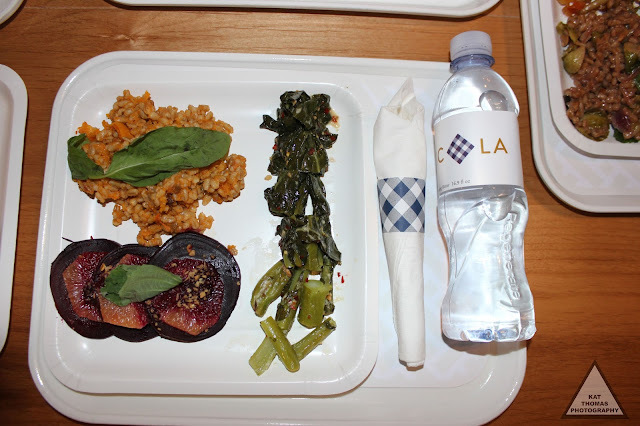 Last month Edible Skinny was lucky enough to experience the new delectable world of Picnic LA. Picnic LA is a fast-casual, produce-driven concept by Brad Zions (Lemonade), Elliot Silver (Vice F&B), and Noah Ellis (Vice F&B, Red Medicine) located at the corner of Culver Blvd. and Duquesne Ave. in downtown Culver City. From Roasted Beets with Cara Cara Orange, Black Currant, Fried Garlic, and Shiso (a fabulous combination with a super tangy bite to it!) 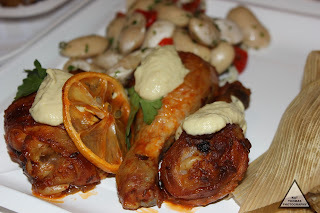 to Mary’s Chicken Leg “Tagine” with Caramelized Lemon, Tahini-Leek Sauce, and Parsley this is the world of the craft flavor profile combination. If Restoration Hardware ever decided to start a restaurant, Picnic LA’s food would be their dishes! The blue and white bedecked restaurant features a menu of elegant foods prepared simply, with an emphasis on seasonal veggies and composed salads, along with roasted free-range chicken, beef, and other proteins. 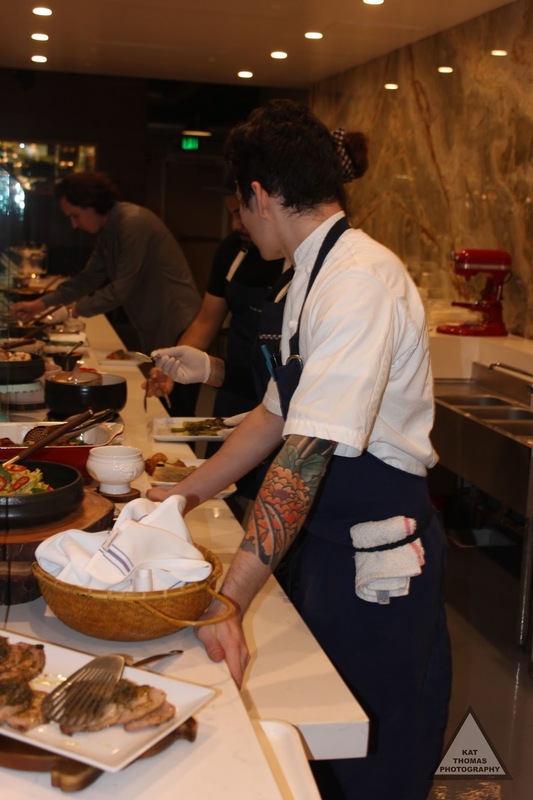 Its menu is dynamic, seasonal, and features flavors seen across the diverse city we call Los Angeles. Chef and partner Alex Resnick (not to be confused with Alex Reznik of Top Chef) previously worked with Ellis at Red Medicine and is heading up the seasonal, largely market-driven menu full of ins and outs in flavors and styles. Resnick takes food seriously the way an IRS agent would approach doing his own taxes. For Resnick, it’s all about the details. 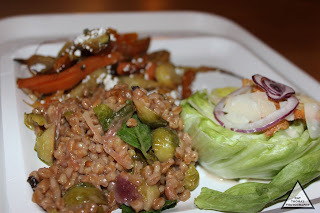 My absolute favorite dish was their Green Lentils Du Puy with Spicy Mustard Vinaigrette and Crispy Shallots, while my guest (Miss Julia Reed Nichols) adored the Farro & Roasted Brussels Sprouts with Pickled Shallot, Peanut, Thai Basil, and Mint. These are dishes as intricate as the Alt-J song they’ll accompany at the Hollywood Bowl. 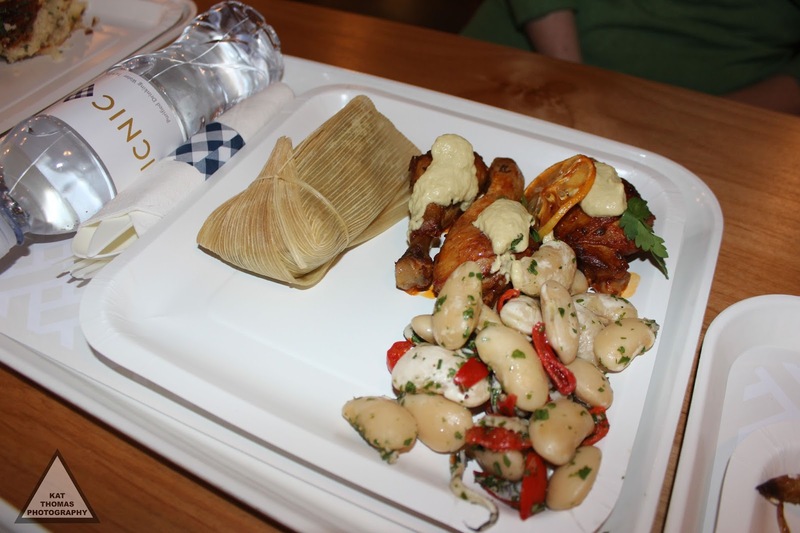 The masterfully branded eatery will also feature a retail component with picnic kits and accessories, foodstuffs, wines, and other specialty items curated by Silver and Ellis. Leveraging the latest in hospitality technology, the restaurant is designed from the ground up to make in-store ordering, order ahead, and pick, and delivery as fast and convenient as possible for guests. “Picnics on Demand” are available for take-out and delivery, making it easy for guests to picnic at the beach, the Bowl, or the back yard. And don’t forget to leave some room for dessert! Picnic LA’s Pineapple Clafoutis was fantastically moist and peppered with thyme for that perfect sweet savory combination. Other sweet tooth offerings included Picnic LA’s Key Lime Pie Bar with Graham Cracker Crust and made with Sour Cream and Dark Chocolate Pot de Crème made with Valrhona single origin dark chocolate, toasted coconut, and crunchy feuillentine. Yummm (with 3 Ms!!!)! So if you’re looking for that perfect 20 minute meal (other than Chipotle…) or require the perfect symphony of flavors for your trip to the LA Philharmonic, Picnic LA just might be the local neighborhood spot for you!